May 12, 2008 – she eats. Are you mad for morels? Have you ever considered setting the woods behind your house aflame in hopes of creating your own little morel heaven? Do those little miracles inspire you to acts of culinary greatness? If this sounds like you, then you must check out the Morel Mushroom Recipe Contest sponsored by Marx Foods. Submit your favorite mushroom recipe — for any mushroom, not just morels — to the Marx Foods website by Friday, May 16th. 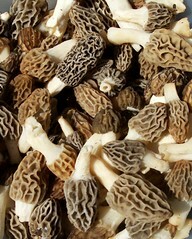 The chef behind the most delicious recipe will be awarded two pounds of fresh, wild morels. No freeze-dried mushrooms here, folks; this is the real deal. That’s $105 worth of savory, decadent, earthy fungi-based goodness for the mere submission of a recipe (…that is if you win, of course). While you’re there, check out the wide assortment of exotic foodstuffs offered at Marx Foods, including but not limited to: truffles, fiddlehead ferns, ostrich, kangaroo, farmstead cheeses, geoducks and — my favorite — frog legs. If you’re having trouble sourcing a specific exotic ingredient, chances are Marx carries it. Morel picture courtesy of Flickr user ~flutterby~. Posted on May 12, 2008 May 12, 2008 Categories food news, links, meat / BBQ, produce4 Comments on Mad For Morels?